The current political crisis in Haiti has reached an unprecedent level. The creation of an evaluation commission was supposed to facilitate the electoral process; however, somehow it has managed to make things worst. Now both the Group G8 with jude Celestin and Fanmi Lavalas rejected the Commission of Evaluation. they actually consider this action as the latest manouver by the president and are calling on the Haitian population for keep the pressure on the government. The group G8 said that the learned the formation of a commission via the news media. They also stated that they noted that the request for the formation of a commission came from the CEP but the request was never made public. 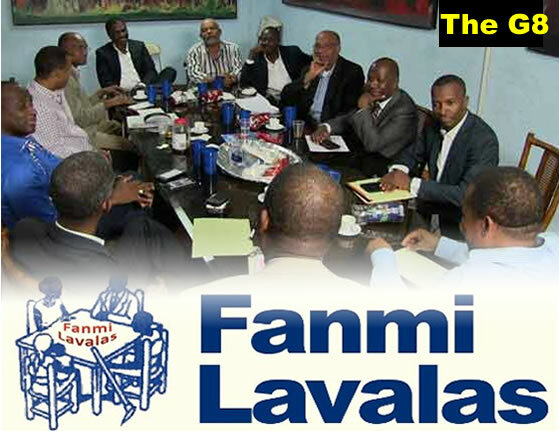 Both G8 and Fanmi lavalas feel that both the Executive and the CEP that are at the origin of this commission are part of the current problem and that it is unthinkable to have them engaged in the formation of a commission to impose a solution to the problem. Kriz politik an Ayiti kounye a rive jwenn yon nivo unprecedent. Kreyasyon yon komisyon evalyasyon te sipoze fasilite pwosesis elektoral la; sepandan, yon jan kanmenm li vin fè bagay yo pi mal. Koulye a, tou de G8 Group ak Jude Celestin ak Fanmi Lavalas rejte Komisyon sa. Yo aktyèlman konsidere aksyon sa a kòm yon dènye manev pa prezidan an, epi yo rele sou popilasyon ayisyen an pou kenbe presyon an sou gouvènman an. gwoup G8 la te di ke li te aprann fòmasyon yon komisyon atravè medya yo. Yo menm tou yo deklare ke yo te note ke demann lan pou fòmasyon yon komisyon te soti nan CEP a, men demann lan pa te janm fèt piblik. Tou de G8 ak Fanmi Lavalas santi ke tou de Egzekitif la ak CEP a ki nan orijin komisyon sa a, yo fè pati pwoblèm. Kounye a ak ki kouray yo angaje nan fòmasyon yon komisyon pou enpoze yon solisyon a pwoblèm nan.